Things get worse for Scratch and his first aspect Garogga, the saber-tooth tiger, when their Ice Age journey leads to an encounter with Strick’s prehistoric aspect: The Cat Who Walks By Himself! Meanwhile, Penelope strikes a bargain with Dr. Schrodinger and uncovers one of his secrets. Plus: a surprising guest cat! All this and cover art by Herobear and The Kid creator Mike Kunkel! In 2010 I was introduced to what I consider to be one of the greatest animal superheroes of all time – Scratch 9. Scratch is a cat who can call forth past/future versions of himself who have historically-themed powers (sometimes having a prehistoric or techie-future version of your self is very handy in a fight with evil). Four years later, thanks to his creator / author Rob Worley, Scratch is still saving the world, setting good examples and being vastly entertaining. 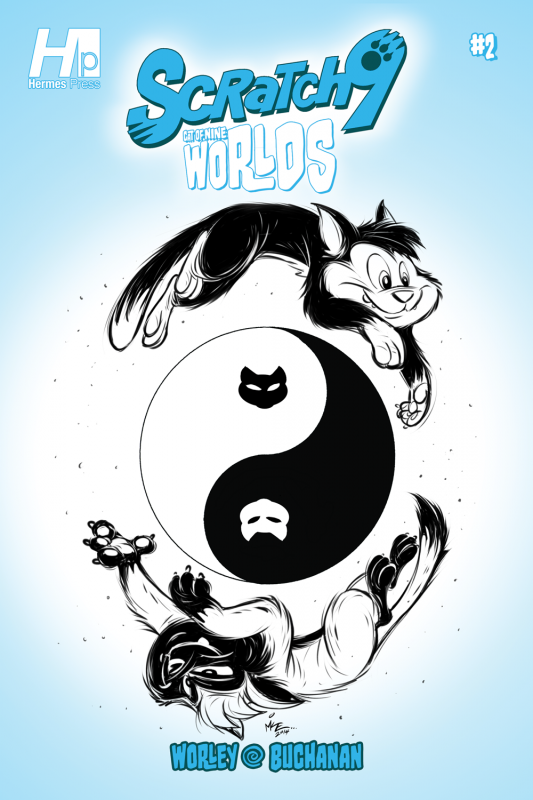 In Cat of Nine Worlds, Scratch and his human side-kick Penelope find themselves fighting a two-tiered battle against the diabolical team-up of Scratch’s nemesis the now fully-robotic Dr. Schrödinger and Strick, a cat who can reverse Scratch’s powers and send Scratch back in time. Scratch 9 is a family-friendly book that is a blast for readers of all ages! The book emphasizes problem-solving and talking through a problem while still incorporating some great old-fashioned “Saturday-morning”-style superhero adventure! The art / layout is excellent – well-defined yet non-complex so it is an easy follow for younger readers. The story is nothing less that just plain fun. Can Penelope see if she can uncover Schrödinger’s plot? Can Scratch find his way back to the present while helping his historic counterparts along the way? Issue #2 is out this week – find out! The bottom line: A fantastic series – for families that read together, Scratch 9 is a must have!